Social media marketing is the technique of getting the loyalty of the customers through social media platforms. Unlike traditional media such as press, television and radio, social media is totally different, much more affordable and accessible for any company to publish and spread information about their products and services. In addition, social media audiences are targeted directly to our brand, as it is they who decide to interact with us, and they are interested in our products, thanks to high-level segmentation capabilities, unlike conventional advertising that spreads to the whole world blindly and, therefore, much less effective. We may also reach a unlimited audience, unlike depending, for example, the number of newspaper readers or viewers of a television program. And 24 hours a day! Results are extremely fast compared with the traditional media where response to a marketing campaign can be weeks or months. In social networks outcomes are achieved over a much shorter time. Your ROI matters. The campaigns in traditional media almost instantly expire, during the time duration of the TV ad, the issue of the journal, or the time a user sees a billboard. However, thanks to social networks, our audience and customers can be always connected with our brand. Social media is bidirectional, so we are not only the only who speak, but users are those who get involved with us. In fact, it is essential listening to our customers. Social Media is listen first, sell after. 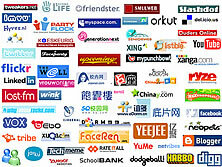 The thousands of social networks now comprise as the main activity on the Internet. Your business should have a presence if you want to be trendy and not lose clients.